From the Eurofighter Typhoon to the Goodyear Blimp, see what’s flying at the 2012 Olympic Games. Aerobatics is not yet an Olympic sport, but plenty of aircraft are involved in this year's Summer Games, where more than 13,500 military personnel will provide security on the ground, in the air, and at sea. Take a look at our gallery, above, to see what's flying. The U.K.'s E-3D Sentry fleet will be on standby during the Games to help coordinate air security in greater London. "Just because we see a Sentry in the skies over London, that doesn't meant there's a reported threat we need to do something about," Air Commander Gary Waterfall told AviationWeek in early March. "It may be we have discovered a temporary gap in radar coverage." 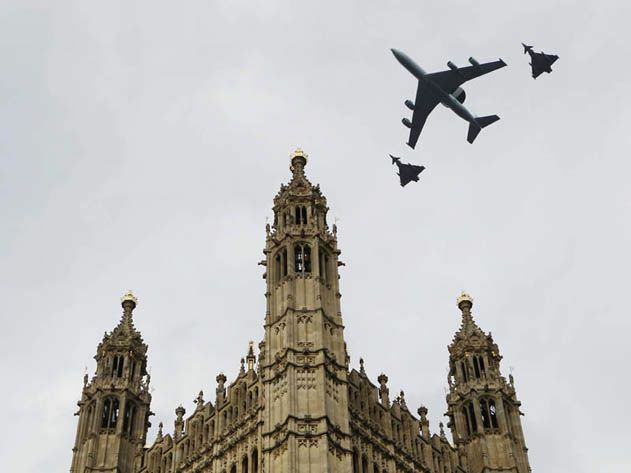 In the photo above, a pair of RAF Typhoon aircraft joined a Boeing E-3D Sentry to fly over the Palace of Westminster in April 2012. The BBC reported in April that seven E-3D aircraft were taken out of service after a fault was discovered on one of the RAF surveillance airplanes; they were returned to flight status later that month. A Lynx Mk8 from British Naval Air Station 815 leaves the flight deck of the HMS Ocean. The Lynx, prepared to intercept hostile aircraft, will have RAF Regiment snipers on board. 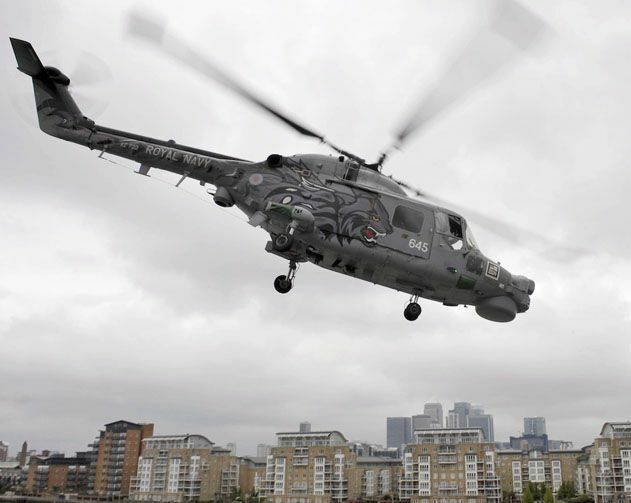 In May, Lynx helicopters assigned to the Royal Navy and Army Air Corps flew practice maneuvers as part of Olympic Guardian, an alert exercise.